The Canadian Union of Public Employees – Manitoba is deeply concerned that the November 21 Speech from the Throne further opens the doorway to privatization of public services and programs, particularly services for children. “The Pallister government has spent the past year throwing our health care system into chaos, and introducing privatization schemes like P3 Schools and Social Impact Bonds,” says Terry Egan, President of CUPE Manitoba. 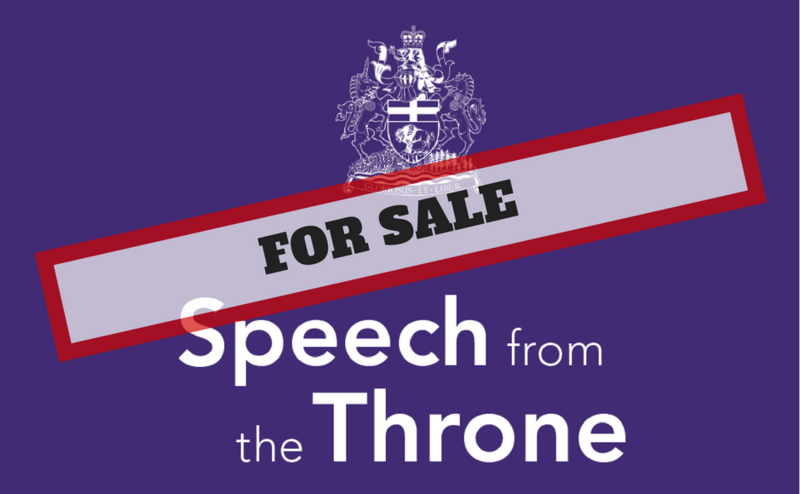 Since last year’s Throne Speech, the Pallister government has rolled out its plan to close Emergency Rooms, cut funding to health authorities province-wide, introduced Public-Private Partnership (P3s) schemes to schools in Winnipeg and Brandon, and pursued Social Impact Bonds – a way for the private sector to garner profit from public social services. Today’s 2017 Throne Speech further reinforces the government’s plan to pursue the dangerous path of privatization, especially in services for children. Meanwhile the government has eliminated transparency and accountability legislation for P3s. “This government is introducing a Social Impact Bond in our child welfare system, and P3s for our schools, but has never had any open discussions on if these models even work,” said Egan. While CUPE recognizes the need for improving access to child care in Manitoba, the government’s plans to provide incentives to the private sector to build more private child care spots is not in the best interest of Manitoba families. recently passed by the Pallister government. on behalf of the Partnership. injunction, to prevent this new law from being proclaimed until after a court ruling. that would prevent the government from proclaiming the Act. with government but that the process was unproductive. • Provided no feedback on proposals from public sector unions. • Made no amendments to Bill 28, despite concerns raised by labour at committee hearings. clear that the Pallister government was never serious about consulting with anyone,” said Rebeck. Winnipeg – With the conclusion of the 41st Legislature, the Pallister government is willfully passing legislation that will disrupt health care, hurt working families, and will leave Manitobans with more questions than answers, says CUPE Manitoba. “Pallister’s government is willfully passing irresponsible and ill-conceived legislation that leaves more questions than answers,” says Terry Egan, President of CUPE Manitoba. “This whole session the government has acted like amateurs by tabling ill-conceived legislation, and Manitobans will suffer because of it”. In a sitting that lasted past 3 am, the government passed legislation including Bill 28 (Public Services Sustainability Act) which imposes wage freezes on public sector workers, Bill 29 (Health Sector Bargaining Unit Review Act) which forces union representation votes in health care, and Bill 19 (Efficiency Manitoba Act) which carves PowerSmart out of Manitoba Hydro, among other legislation. “Is Bill 28 constitutional? Is Bill 29 necessary? Is Bill 19 really efficient? We believe the answer to these questions is ‘no’,” said Egan. 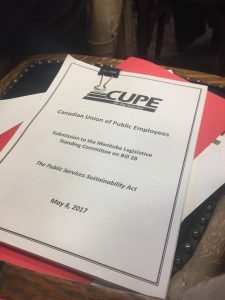 CUPE, along with the Manitoba Federation of Labour has expressed numerous concerns that Bill 29 will unnecessarily disrupt health care services, and that Bill 28 is unconstitutional because the government refused to meaningfully negotiate at the bargaining table. 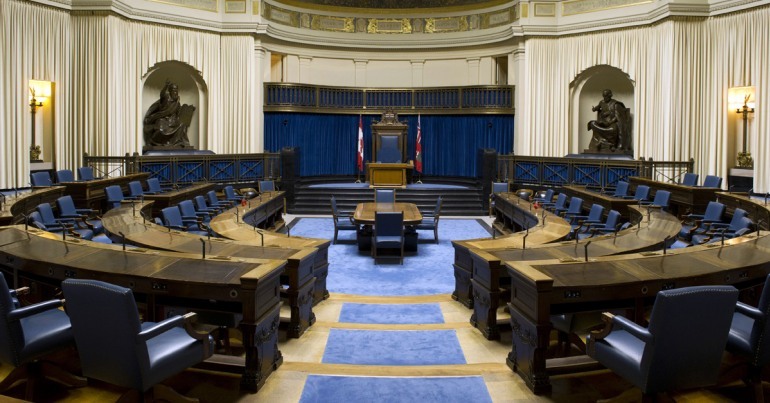 Bill 19 was filibustered by a Conservative MLA who, along with CUPE and Opposition parties raised concerns that the legislation was unnecessary. The government also made sweeping changes to health care, including mandating significant cuts, closing ERs and other programs, cancelling important community funding, and more. “The government uses their majority to pass all their legislation no matter what people say, but they should never forget that the people are watching, and we’re taking notes,” said Egan. “We’re putting this government on notice that if they continue on this path of cuts, reckless lawmaking, and lack of respect for dialogue, then they’ll have more trouble down the road”. The Canadian Union of Public Employees is Canada’s largest union representing over 643,000 members. In Manitoba, CUPE represents approximately 25,000 members working in health care facilities, personal care homes, school divisions, municipal services, social services, child care centres, public utilities, libraries and family emergency services. 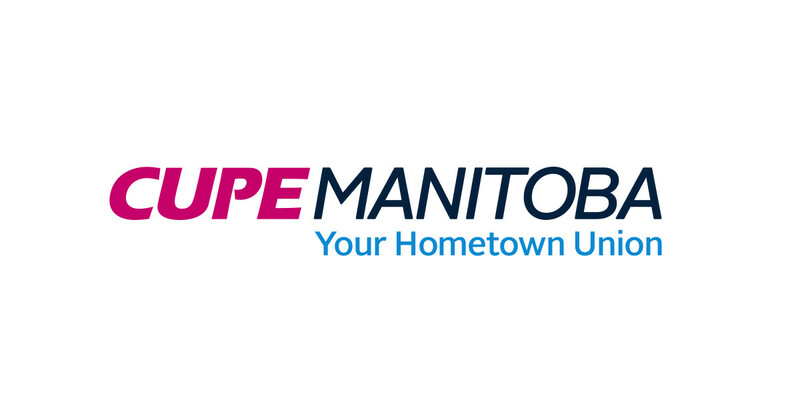 Winnipeg – CUPE Manitoba is concerned that the provincial budget announced today leaves the door open for the unchecked privatization of public services and programs, while eroding existing public services. The government recently announced that current P3 Accountability and Transparency legislation will be eliminated, and echoed this move in today’s budget. “This government insists that public transparency and accountability is a ‘regulatory burden’”, said Kelly Moist, President of CUPE Manitoba. “We believe the public has the right to know the details of private contracts that are receiving public dollars”. The budget’s language of “new”, “innovative”, and “collaborative” approaches to the government’s long-term care investments is also concerning, considering this language is often double-speak for privatization. There is no clear commitment that the 501 new childcare spaces announced in the budget will be fully public. CUPE is also concerned with the continued emphasis on Social Impact Bonds as a medium to deliver public social services and programs. “While the budget references a ‘Made in Manitoba’ Social Impact Bond program, there is very little detail in what programs and services will be affected,” said Moist. “We are pleased however that the government is interested in supporting community Social Enterprises, and hope the government continues to support community-led initiatives and leaves private for-profit corporations out of it”. “The government has already broken it’s promise to protect public services and the workers who provide them by closing ERs, laying off hundreds of Hydro workers, and imposing wage freezes on workers province-wide” says Moist. “We need to strengthen – not cut or privatize – our programs and services and this budget does not give us much confidence”. The Pallister Government’s first provincial budget offers minor improvements to many important areas of the public sector, says CUPE Manitoba. “We are pleased to see this government’s continuation of funding to health care, education, post- secondary education, and social services,” says Kelly Moist, President of CUPE Manitoba. “In an environment where cuts would have been the ‘easy way out’, we are pleased that this government listened to Manitobans, and has instead maintained or increased funding to many key public services”. CUPE Manitoba applauds funding commitments to the Aboriginal Academic Achievement Fund, which will help ensure Community Liaison Workers in the Winnipeg School Division have the tools they need to perform their important work. These workers were under threat of significant job losses and funding cuts in early 2015. CUPE also hopes the new Premier’s Enterprise Team will include representatives from labour, which were included in the former government’s Premier’s Economic Advisory Council. However, the government’s ongoing pursuit of Social Impact Bonds causes serious concern. “While we are pleased that the Manitoba Government has not implemented major cuts, we are very concerned with this government’s ongoing promotion of Social Impact Bonds,” says Moist. “Social Impact Bonds are an abdication of government responsibility for marginalized or vulnerable people, and we must reject these profit-making schemes”. Additionally, while many mandate letters to the newly appointed Ministers call for increased involvement from the private sector, including in childcare, there is no mention of increased private involvement in the budget documents. “We still need to see how exactly this funding is rolled out,” says Moist. “We need a strong commitment from this government that they will not privatize or contract out any public services”. Consult this handy guide to find out what’s at stake for CUPE members across Manitoba and in your sector. The guide also includes suggestions for questions to ask candidates in the lead-up to the April 19 election. Contact CUPE-MB to order paper copies. Manitoba provincial election: What’s at stake for CUPE members? Today the Premier of Manitoba officially dropped the writ, beginning a month-long election that will determine the next government of Manitoba on April 19. But what does this election mean for CUPE members? The Conservatives and Liberals want to cut jobs, privatize services, and reverse the gains we have made as workers under the NDP. While election platforms will be rolled out throughout the campaign, we have already seen overtures made by the Conservatives and Liberals that will affect our members. School Sector workers: the Conservatives have promised not to cut teaching jobs, but don’t rule out funding cuts to schools. Funding cuts to schools mean School Boards will look to our support staff members and programs for “savings”. The Liberals have announced that they too will find millions in “savings”, but haven’t yet said where they will cut. Liberal governments in other provinces have pushed school support staff on strike with layoffs and funding cuts. Child Care workers: the Conservatives have openly discussed creating more private child care centres across the province. Private centres mean higher costs for parents, lower quality, and cut corners. The more private centres the Conservatives build, the less support public centres will receive by government, driving down wages for our members.The Liberals recently announced their child care plan, which is contingent on funding from the Federal government, and has very few details. Social Services workers: Conservatives have indicated they want to privatize social services by introducing Social Impact Bonds (SIBs). SIBs allow big multinational corporations to “sponsor” a program, and will receive a “return on investment” if the program succeeds. This would certainly affect our members as government funding is cut. In fact, the last time the Pallister Conservatives were in power in Manitoba, they cut millions of funding to social service agencies, including many where CUPE members work today.In other provinces, Liberal governments have cut social services to the core. Health Care workers: When the Conservatives were last in power, Brian Pallister was a Cabinet Minister and he cut health care jobs. Many CUPE members remember the impact of these cuts.The Conservatives today are no different. They have already discussed finding ways to reduce the workforce in order to “save money”. In Saskatchewan and Alberta conservative governments have privatized laundry services and cut jobs. The Alberta Conservatives even wanted to introduce fees for health care services. Albertans had enough, and voted in an NDP government. In Ontario and BC, Liberal governments have found “savings” off the backs of workers. In BC, laundry services have been contracted out resulting in job cuts and pay cuts. Liberals in Manitoba would surely follow that lead. Municipal workers: Pallister’s Conservatives have a policy on the books to immediately rescind Manitoba’s groundbreaking Public Private Partnership Transparency (P3) legislation. By doing this they will eliminate accountability and transparency for P3s, which take away jobs from public sector workers, and are far more costly than traditional procurement. Conservatives will also make sure that new infrastructure is owned and operated by private companies (through P3s), rather than municipal governments. That means there will be less “need” for public sector workers like you, and it will likely result in downsizing and contracting out.Liberal governments have also promoted the use of P3s., especially in Ontario and the east coast. The Ontario Liberals have been major advocates of P3s despite their Auditor General pointing out that P3s have cost Ontarians $8 billion more than traditional, government managed projects. Liberal governments in Quebec have interfered in municipal bargaining, resulting in major labour action in municipalities across the province due to cuts, contracting out, and attacks on pensions. Crown Corporations: While Pallister’s Conservatives have denied that they would privatize Manitoba Hydro, the last PC government in Manitoba also denied they would privatize MTS, and then turned around and did so. The Pallister Conservatives have been constant critics of Manitoba Hydro and its planned developments. The Manitoba Liberal Party has already indicated they will privatize Manitoba Liquor stores, which means they are likely eyeing other places to encourage privatization. Manitoba Liquor stores earn over $280 million in annual profits which are used by the provincial government to pay for government services such as health care and education. 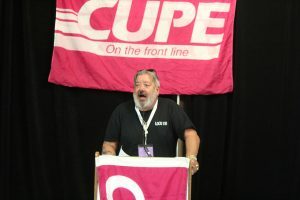 At the most recent CUPE Manitoba Convention, members from across the province voted to endorse the NDP. If you take a look at the track record of the NDP in Manitoba over the years, it is clear they are prepared to work hard for workers in our province. School Sector workers: The NDP in Manitoba has consistently increased funding for schools. Class sizes have been reduced, while supports for staff have increased, including wages. Child Care workers: The NDP has tripled public child care funding, and has implemented wage enhancement to increase pay for child care workers. They have also promised to build more public child care centres, and increase spaces by 12,000. Manitoba has the most affordable child care outside Quebec, and the NDP is committed to universal child care for all. Social Services workers: Many of the social service agencies in Manitoba today exist because the NDP has prioritized community development, and has reinstated much of the funding that was cut in the 90’s. The NDP hold the firm belief that investing in social services means investing in the community and protecting those who need it most. 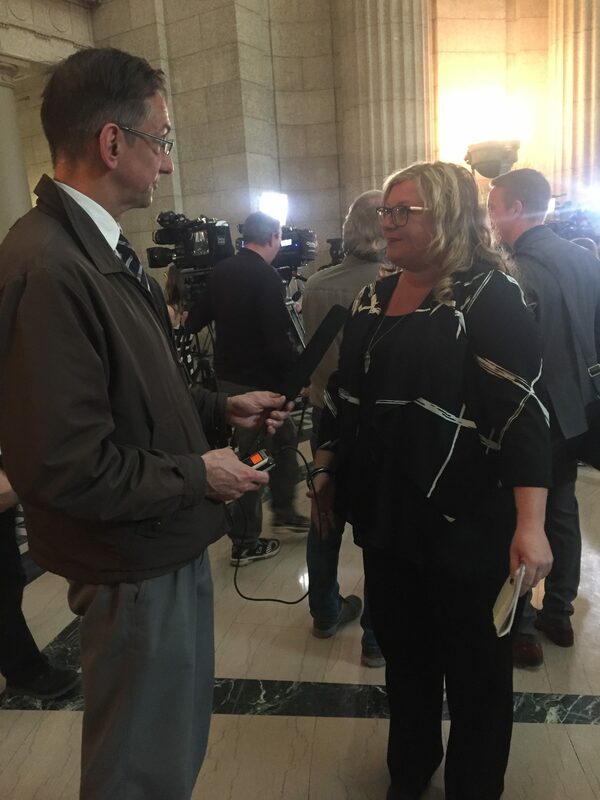 From supports for mental health to supporting the Truth and Reconciliation Commission recommendations: the Manitoba NDP support social service programs and jobs. Municipal workers: The Manitoba NDP has created the first-ever P3 Accountability Legislation in Canada, recognizing that public workers can do the job better, cheaper, and with more accountability to the taxpayer. The Manitoba NDP has also consistently funded infrastructure, provided supports to municipalities across the province for things like arena maintenance, community programs, and parks. Health Care workers: The Manitoba NDP has consistently made health care a priority, and is building new personal care homes across the province. While other provinces are cutting jobs, cutting pay, and privatizing services, the Manitoba NDP have always invested in health care. Crown Corporations: The NDP will continue to invest in Manitoba Hydro, investing in both generation and transmission capacities. The NDP has promised to keep the MLCC public. April 19 is an important day for CUPE members to get out and vote. But you can do more! CUPE members are encouraged to volunteer in local NDP campaigns, and help re-elect Manitoba’s worker-friendly government. Talk to workers from other provinces about the challenges they’ve faced under Liberal and Conservative governments. The stakes have never been higher, and now is the time to take action. For more information on the provincial election, visit cupe.mb.ca/category/manitoba-provincial-election. The province’s Economic and Fiscal Outlook tabled in the Manitoba Legislature today offers a more progressive way of ensuring that the wealthy pay their fair share. With the implementation of a new tax bracket that would see Manitoba’s highest earners provide slightly more in income taxes, the province is able to expand tax credits and supports for lower income earners. “The 98% of Manitobans who don’t earn over $170,000 per year expect the government to help build a more level playing field,” said Kelly Moist, President of CUPE Manitoba. “Ensuring that the wealthy pay their fair share is good for working families”. The fiscal outlook is an excellent tool for Manitobans to understand the nature of government budgeting, as well as a current look into the state of the Manitoba economy. “While the Progressive Conservatives used much of today in an attempt to filibuster the government’s update, we are pleased that it was ultimately tabled for Manitobans to view,” said Moist. “The PCs have yet to offer Manitobans anything of substance themselves, and instead turn to parliamentary tactics to stall valuable discussion”. The Manitoba Government is also committed to continued funding to health and education, and expanding childcare, ensuring that the province builds stronger public services for Manitobans. “Other provinces are opting to cut funding to schools and hospitals, while Manitoba chooses to invest,” said Moist. “Manitobans should be proud that this government continues to fund the services we all rely on”.